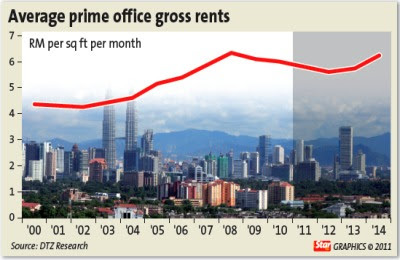 PETALING JAYA: The abundance of office space supply in 2011 is expected to create pressure on rental rates for this property sub-sector. The property market in Cyberjaya is proving too hard to ignore for SP Setia Bhd as the developer is taking a second stab at the growing area. Malaysia's biggest developer by sales will launch a RM3 billion eco-themed project in Cyberjaya, Selangor, early next year. "Cyberjaya is a market you must not ignore. We are looking at 3,000 to 4,000 expatriates working there who need housing," chief executive officer Tan Sri Liew Kee Sin said in a briefing in Cyberjaya yesterday. "We will be targeting mainly the senior staff of multinational companies and Malaysians who want to invest or live here," he said. Cyberjaya is the base for many multinational companies' support centres. Chipmaker AMD, for instance, recently opened an office that will support the finance and IT needs of its global operations. SP Setia's project will be called Setia Eco Glades and it will feature 2,437 units of superlink houses, semi-detached homes, bungalows, condominiums and shoplots. It has partnered Setia Haruman Sdn Bhd, the master developer of the Cyberjaya Flagship Zone for the project. SP Setia will hold 70 per cent of the joint venture while Setia Haruman holds the rest. The joint venture is buying 107.2ha of land from Setia Haruman for RM420.4 million or RM36 per square foot. This is the second attempt by SP Setia to buy land in Cyberjaya. In 2007, it agreed on a deal to buy 63.18ha from Setia Haruman for RM190.6 million but this fell through in 2008. Liew said SP Setia aims to price its semi-detached units and bungalows from RM2 million and RM3 million, respectively, similar to homes at its Setia Eco Park development in Shah Alam. The first phase of the project, comprising condominiums and semi-detached homes, is targeted to be launched by the first quarter of next year. "We are bullish on sales. Cyberjaya has ready infrastructure," Liew said. On funding, Liew said SP Setia will partly borrow from banks. CYBERJAYA: Property developer SP Setia Bhd has bought 108.5ha of prime freehold land in Cyberjaya's flagship zone for RM420.4mil from Setia Haruman Sdn Bhd. The land will be developed as Setia Eco Glades project by Setia Eco Villa, a joint-venture company between SP Setia Bhd which holds 70% and Setia Haruman Sdn Bhd 30%. SP Setia president and chief executive officer Tan Sri Liew Kee Sin said the project would be a mixed residential and commercial development. “It is expected to have a gross development value of RM3bil,” he told a press conference after a signing ceremony between SP Setia and Setia Haruman. 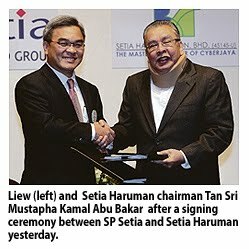 Liew represented SP Setia while Setia Haruman by its chairman Tan Sri Mustapha Kamal Abu Bakar. Liew is optimistic about the demand as the project will be targeted to high-end customers in Cyberjaya. “Cyberjaya is a market that you must not ignore. It provides huge potentials as there are ready customers from 5,000 multinational companies operating there,” he said. Giving indications based on Setia Eco Park in Shah Alam, Liew said it offered RM2mil for a semi-detached house and a minimum RM3mil for a bungalow. Setia Eco Glades will be created as a new eco-themed development in Cyberjaya based on its flagship development, Setia Eco Park. The project is expected to commence in financial year-end 2012 and span a six-year development period. Meanwhile, Mustapha Kamal said there was about 680ha still available for sale in Cyberjaya. “I truly believe after this signing ceremony, the land price would not be the same any more,” he added.